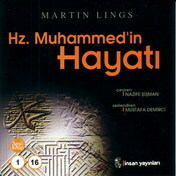 The Life of the Holy Prophet by Martin Lings, who is known for his many books translated into Turkish, has been converted into an audio book by Insan Publishing House. Translated into Turkish by Nazife Sisman and vocalized by Mustafa Demirci, the work consists of 16 CDs. Please type '672' into this field.